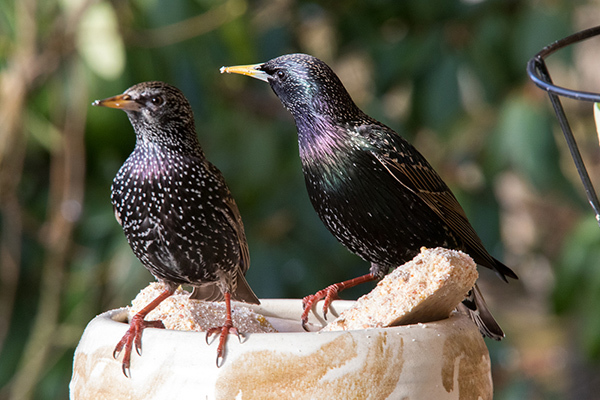 European starlings (Sturnus vulgaris) are now common birds in the United States; and sometimes, as they say, familiarity breeds contempt. Loud, boisterous and ballsy, the birds are known to eat through crops, monopolize feeders and cause airline disasters. A naturalist group, the American Acclimatization Society, purposely introduced 60 European starlings from Europe into New York’s Central Park in 1890. Led by pharmacist Eugene Schieffelin, the society embarked on a culturally enlightening but environmentally devastating program to bring to the New World all of the European flora and fauna mentioned in the works of William Shakespeare. Today, the offspring of those original 60 birds have spread across the continental United States, northward to southern Canada and Alaska, and southward into Central America. It’s estimated that there are now more than 200 million starlings in the United States. Part of the reason for the starlings’ success here is because they are among the few species of birds that can tolerate high human densities and poorly vegetated landscapes, such as industrial sites. Normally, the only places where you won’t find them are in deserts, above the timberline and in heavily wooded regions. Another reason the birds thrive is that they have few predators. While young starlings often die from adverse weather, starvation or death by animals such as domestic cats, owls, raccoons and rats, adult starlings face little threat—other than control programs in agricultural areas and falcons or hawks that occasionally catch them in flight. And that’s when their beautiful “sky dance” occurs. In the fall and winter months when starlings gather in large, dense flocks to migrate south, they attract the attention of raptors. To evade them, the birds resort to performing complex movements in unison that result in “clouds” or “waves” called murmurations. All the veering and weaving to throw the predators off their tails works; more often than not, the falcon or hawk gives up. Some explain the phenomenon strategically, believing that each starling’s game plan is to reproduce as much as it possibly can in a lifetime. Essential to that end is surviving from moment to moment. 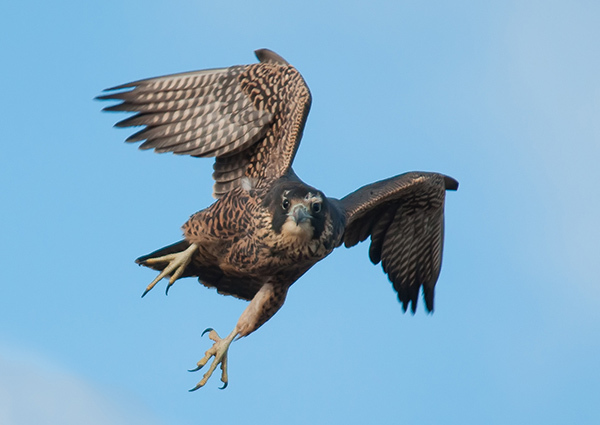 Therefore, the focus of each desperate bird is to dodge the falcon. The wondrous clouds of starlings are the product of independent attempts by each individual, within the multitude of self-interested starlings, to place itself between other birds and the predator until the hunter leaves. The whole display, then, is just a predator-prey interaction, much like a lion-wildebeest encounter on the Serengeti Plains. 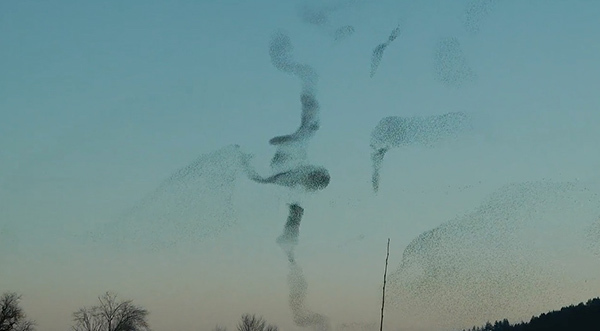 That’s one explanation for the spectacular starling formations in the sky. Another—more poetic—account could be that it is a great dance that happens when the birds annually meet in the blue. 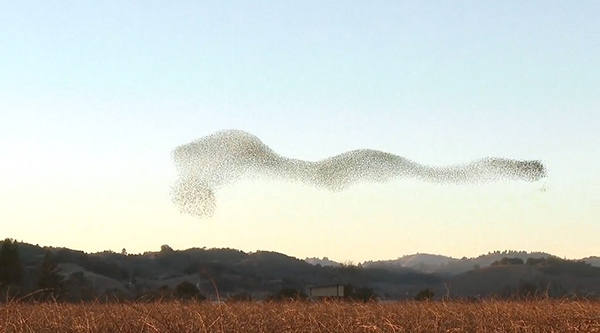 Watch the short video below, titled The Starling-Falcon Dance. It was produced by photographer Nick Dunlop, with music by Tony Anderson. After viewing it, you may find room within yourself for both starling murmuration theories. Whatever you think of starlings, they look beautiful in the sky. I agree with you, Lynn! Thanks for the comment. —C.G.A.